Lawrence City Commission, Tuesday, Feb. 5, 2019. City of Lawrence leaders have approved a new pay plan that will provide more than $400,000 in pay raises for city employees beginning next year. 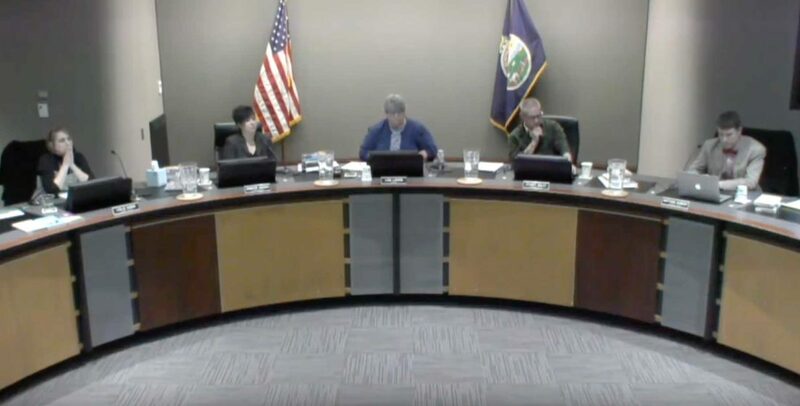 As part of its meeting Tuesday, the Lawrence City Commission voted unanimously to provide funding to increase employee pay. The decision came after the commission received a study of the city’s compensation plan that indicated a significant number of city employees are underpaid when compared to their peers in other cities. Mayor Lisa Larsen said that the city has to be more competitive when it comes to employee pay and that the city should be paying the market rate. “We have some really highly technical positions, as well as just our full-time positions, that we should be the leader in,” Larsen said. Commissioner Matthew Herbert also said that the city has to start being competitive if it wants to keep the best people working for the city. McGrath Human Resources Group, which conducted the study, found that almost 40 percent of the city’s benchmark positions have not kept pace with the market, causing the city to have problems with recruitment of qualified applicants, according to the report. McGrath recommends pay increases over the next five years to make the pay market-competitive. The human resources division recommends implementing the 2019 changes with the first pay period in the second quarter of 2019, according to a memo to the commission. The cost to bring all employees into the new pay grade for 2019 is estimated in the memo at $412,814. The city already budgeted $75,000 for pay increases in 2019 and an additional $83,193 was made available due to reductions in longevity payments, leaving $254,621 that would still need to be funded. In response to questions from the commission about funding the raises, Finance Director Jeremy Willmoth said that the city funds that contain the majority of city employees, the general and utility funds, have significant dollars potentially available. If budgeted funds are not available later in the year, then the commission would need to amend the budget as part of a future meeting. Commissioners also asked about cost-of-living adjustments after a city employee said during public comment that employees had not received such adjustments for years. In response to questions from the commission, Assistant City Manager Casey Toomay said that prior to 2007, the city did budget both a general wage increase for cost-of-living and funds for merit increases. Toomay said that the city made a decision to stop budgeting the cost-of-living increases because of fiscal constraints and only fund the merit increases. “And I think, as Dr. McGrath pointed out, we have not been adequately funding that merit pool and we’ve all known that, but we’ve continued to have fiscal challenges and other budget priorities that we’ve tried to balance,” Toomay said. McGrath is recommending the city bring back the cost-of-living adjustments. Toomay said that funding for cost-of-living adjustments is not part of the current pay increases but would come to the commission as part of the 2020 budget discussions.